Aloha shirts were originally made by Japanese immigrants in Hawaii, and made with Kimono. Pagong offers their own brand of western clothing with traditional Kyoto yuzen. All of their Aloha shirts are made with 100% silk. Accessories are also available. Of course, all of these items are made with yuzen style. Clothes are little bit expensive but, these items are offered with reasonable price. It is good for the gift, these vivid colors will make you happy! These shoes caught my attention, how cute they are! Since they are flat-heeled, good for long walking. If you get tired of walking around Kyoto during the traveling, please try this! It will give you a comfortable walking. And carry-on suitcases are also available, these shop have some convenient items for tourists. Must check! 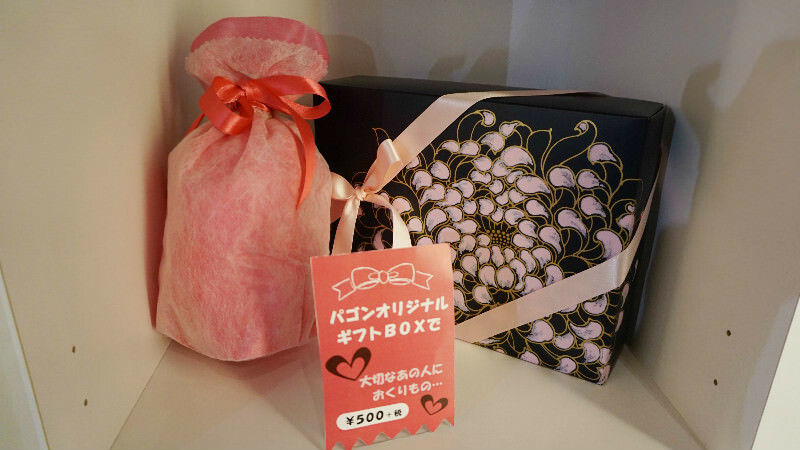 Gift boxes which are decorated with Japanese design are available with extra charge, if you purchase a gift, these boxes make the gift more gorgeous! This shop offers get a tax refund and accept the shipping service to abroad, please ask feel free to staffs about that. Pagong is special in that they use the yuzen dying technique also used for dying kimono fabric. What strikes me about this shop are their aloha shirts; the bright colors of the shirts get a somewhat subdued vibe from the kimono dying technique and make them appear not gaudy, but stylish. If I had to get but one thing at this shop, it would have to be an aloha shirt. If you want to buy good quality clothes made in Japan, I recommend URBAN RESEARCH KYOTO! Traditional Japanese hair comb that you can buy in Kyoto Station! Japanese chopsticks that you can put your names on!